Atzaró's coastal outpost above the beautiful Cala Nova near Es Caná. Open since the summer of 2012, Atzaró Beach in Cala Nova is a wonderful addition to the spectacular Atzaró Agrotourismo in the San Lorenzo countryside. 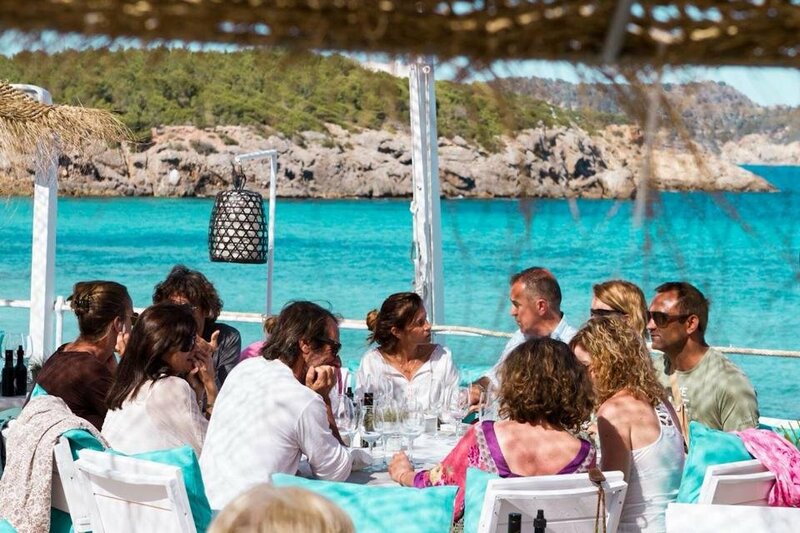 Situated just outside Es Caná above the sandy beach of Cala Nova, Atzaró Beach - Atzaró's very own chiringuito and restaurant - is as relaxed and beautiful as its rural counterpart, though a smaller, more casual affair. Enjoy fresh food and cocktails just metres from the sea, with regular live music or simply the sound of breaking waves. The delicious restaurant menu is modern Mediterranean with a fishy focus - or 'seafood inspired', to use a more palatable term. Like its larger inland cousin, Atzaró Beach is appropriate for all ages (there's even a kiddies' corner in the restaurant), with a large outdoor terrace perfect for weddings, events, meetings or just relaxing on your own and watching the sea slide by. Atzaró Beach also hosts the odd party and after-party, so keep an ear out for party announcements in the summer.